All my readers at Purrfectly Beautiful know that this kitty loves lipstick. And my all-time favorite lipstick these days (it could change at any minute) is Urban Decay’s Revolution Lipsticks. These lipsticks are EVERYTHING! The colors are totally fab! Bright, bold, look at me colors, that make you strut your stuff when wearing them, I’m not kidding! My two favorite colors are Anarchy and Obsessed. The wear time on this lipstick is insane! It lasts 8+ hours. I am a huge water drinker and even through multiple water bottles my lipstick lasts 8 hours. I apply first thing in the AM and that’s it-it lasts all day. There is nothing I love more than long-wearing lipstick. Another thing I LOVE about this lipstick it is made without parabens, sulfates and phtalates! Those are horrible icky things that I don’t like in my make-up. 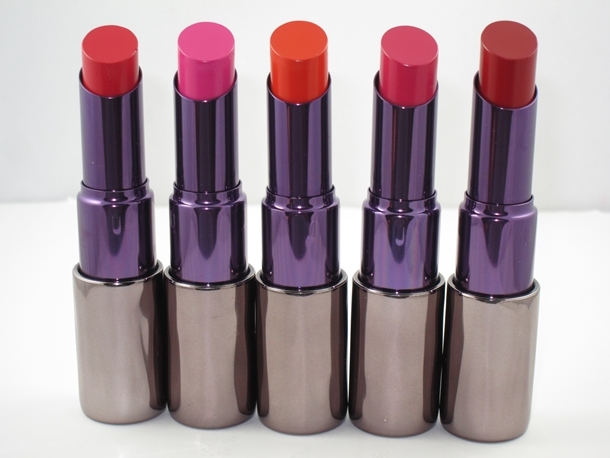 There is a color for everyone in the Revolution Lipstick line. Urban Decay will not disappoint you! Go out and get this lipstick and send me your lip pics! I give this lipstick 4 paws up! I’ve heard good things about these but haven’t tried them before. Love the colors! Go to Sephora and try it out, I guarantee you’ll love it!